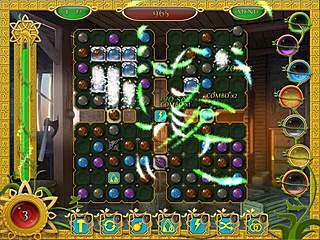 The Legend of the Golden Tome is a combination of match 3 and hidden object game. The Golden Tome is a magic book written by the druids and hidden by six of them in the cave. And only a chosen one can find it and open it. It is a special destiny to protect and use the Golden Tome. So you have to prove that you can manage this by means of passing several challenging trials – both finding the objects and matching 3. Succeeding that will help you to find 6 crystals that are necessary for finding the book. Aidan, the druid who tells you the story, will be your guide and prompt you on your way. In The Legend of the Golden Tome you can find not only decent graphics but also nice Celtic music and wonderful overvoicing. The hidden object scenes are pretty much typical. You're provided with a list (either words or pictures) of the objects you're to search. Be prepared to look for such items as mallet or chisel. The objects are hidden really well. But the hint button recharges quickly and you're not limited in using it. At the same time don't count on random clicking – it blocks the cursor for a while. Besides you can get some extra points for the accuracy. The game has a replay value, as every time you play you earn some points so it might be interesting for you to beat your previous achievements. The graphics are more than just well-done. We're cantankerous when it goes about HOGs, but we do not expect a lot when we play match 3. In The Legend of the Golden Tome you can find not only decent graphics but also nice Celtic music and wonderful overvoicing. The game plot is not fanciful, but don't forget that's not an adventure or quest, it's just a cute combo of three in a raw and HOG. So the game plot might be not the main reason to play it. Talking more about match 3 part, the thing that made me smile was the way the items you had to match looked like. Do you like M&Ms? The game tile reminded me of these candies scattered on the grid. The rules are well-known. But from level to level the task gets more and more complicated. 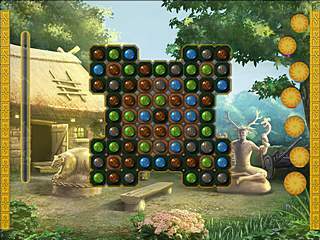 For an example, suddenly the bowls on the right of the screen appear and you need to fill them with colors that make matches of 3 and more stones in a raw of a particular color. So the level is completed only when all bowls are filled. The further you move on, the more boosts you get. Thus, the druid sculptor gives you a magic hammer that can destroy everything on the game tile and the druid wanderer gives you the swap amulet that swaps any 2 tiles on the game field. In order to get the bonuses you need to get them down to the bottom of the game field. It may seem easy, but I'd advise you to collect as many bonuses as you can and not waste them as every subsequent level will be harder and harder. Though there is a good news, after each 100 000 points you'll get an extra life! Try your best to pass the levels as fast as you can, as there are some time bonuses as well. The Legend of the Golden Tome is a gripping game. 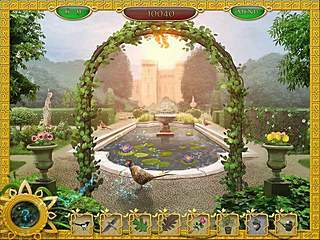 It has many pros for buying it such as graphics, levels diversity and reasonable complicacy. Besides getting the Legend of the Golden Tome provides you with 2 in 1: match 3 and HOG. This is The Legend of the Golden Tome review. Download this game here.